A simple solution for your soft start needs. 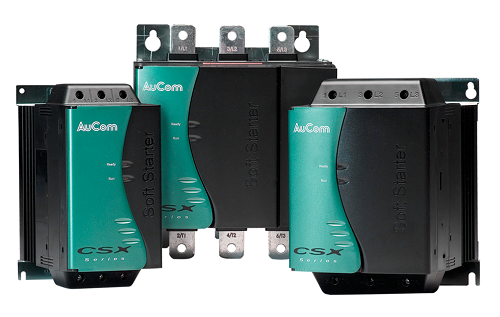 CSX soft start controllers are a reliable, easy to use soft start solution for your motor. Designed for maximum simplicity, these compact starters provide timed voltage ramp soft start and soft stop, and are perfect for fitting into your existing motor control centre. The CSX's small size and integrated bypass relays make installation easy, and allow the soft starter to fit in compact enclosures with limited ventilation. Configuration is as simple as three rotary switches, and remote display and communication options allow trouble-free integration into common control networks.